The River Bride is set on the banks of the River Bride in Dorset and is a study of reflection, light and movement. 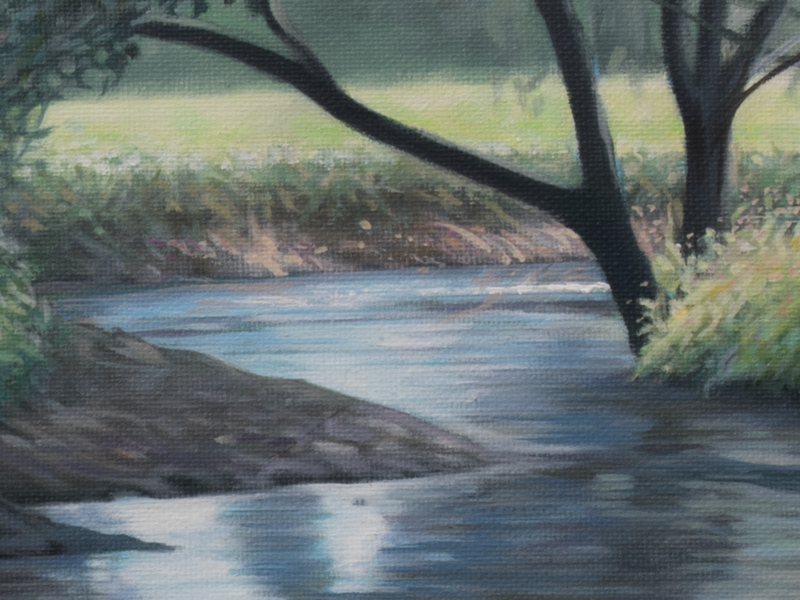 The River Bride was a painting inspired by my time spent on the River Bride in Dorset. I had decided to head down to a section of the Bride where I knew that I could pitch a tent and head off down the river to paint undisturbed. During the course of the day, I moved from one location to another, making small studies of the river and the light. This painting was the final piece in series of Five or so studies. From the outset, I wanted to do a painting where I would drop the intensity of the greens, in favour of a softer tone. I also wanted the softer my 'Flow' technique, while maintaining its sense of rhythm. I was also keen to gently suggest the passing of time, by emphasising the circle around the tree/reflection. In contrast to most of my other works, this painting feels a lot softer. There's also a real spectrum of greens and blues which gives the painting a calming and still character.